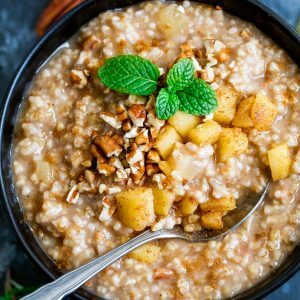 This Instant Pot Apple Cinnamon Oatmeal is kissed with cinnamon apples and ready to rock your busy weekday breakfast routine. Set your Instant Pot to SAUTE function and add your butter. Once butter has melted add your apples. Top with 1/4 tsp cinnamon and a pinch of salt and sauté until tender, approx. 4-5 minutes. Remove apples and set aside. To help prevent sticking spritz the IP's stainless steel liner with spray oil (we love coconut or avocado oil) or rub with butter if preferred. Lock lid and cook on manual high heat for 10 minutes. When the timer beeps, quick-release the pressure (using the release valve) until float valve drops. Unlock lid and stir oatmeal, which will appear super watery at first but thickens as it cools. Stir in pecans, an additional 1/4 tsp, and maple syrup. Spoon the cooked oats into two bowls and top with cinnamon apples. You can drizzle a little milk over the oats if you'd like or top with extra crushed pecans and cinnamon. I've recently been topping my oatmeal with homemade granola too and adore the oat-on-oat combo. If you're making any major changes to the recipe and fairly new to the Instant Pot, shoot me a comment or email and I'd be happy to help guide you!